R48 #1 and two-time defending USHA Four Wall National Champion Killian Carroll met longtime rival and friend Martin Mulkerrins for the 2018 World Championship/USHA Four Wall national title, with both Carroll and Mulkerrins seeking their first world title. That is exactly what Carroll did, as “Flash” slowly worked himself into the game by pecking away at Mulkerrins’ lead. Mulkerrins continued to apply pressure, seemingly hitting the ball harder than it has ever been hit before. Carroll extended a number of rallies with outrageous retrieves, forcing several Mulkerrins errors and eventually tying the game for the first time at 15. From 15-15, Carroll demonstrated why he is the game’s best closer, as the Boston-based #1 scored five of the final six points of the game by utilizing his devastating serve and fly kill. Carroll and Mulkerrins play virtually even throughout game two, with neither player leading by more than four points at any moment during the game. Carroll trailed 8-12 and seemed to be feeling the effects of his seventh game in 24 hours, but as he always seems to be able to do, summoned his mental strength to tie Mulkerrins at 16. 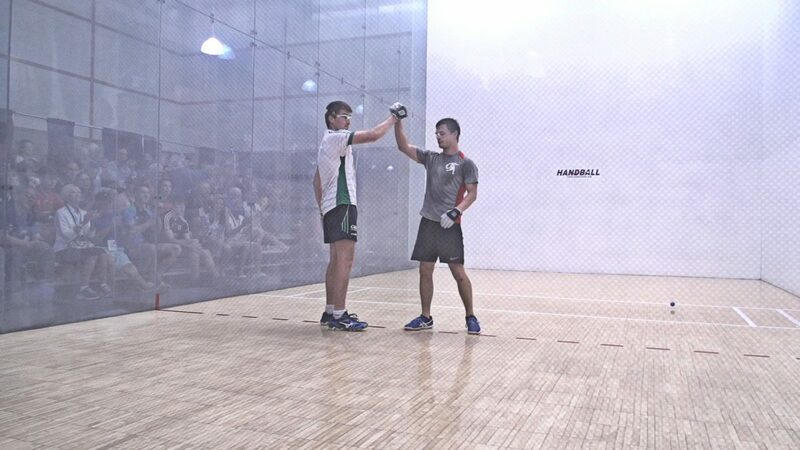 Carroll closed out the game and match, as he had done in each close game in the event, killing consecutive right hand setups to earn his first world title and third consecutive USHA Four Wall national title. “I’ve been coming to handball tournaments for 60 years and I’ve never seen the game played at this level,” stated six-time USHA Four Wall national champion and Hall of Fame legend Fred Lewis. Catriona Casey faced Cianna Ni Churraoin in the upper bracket women’s semifinal for a spot in Sunday’s final. Ni Churraoin pushed Casey to a tiebreaker in the 2015 WR48 NYAC but would not enjoy the same type of success in this semifinal. Casey took charge from the outset, controlling the action from the front court and sweeping Ni Churraoin in two quick games. Defending world champions Robbie McCarthy and Diarmaid Nash has little difficulty with Team LAAC, as McCarthy and Nash swept Mando Ortiz and Vic Perez to advance to the final in the upper bracket. “It looked like Team Ireland knew exactly what to do and the Americans were just trying to hit the ball hard and hope for errors,” stated SR48 #3 and guest WPH analyst Dr. Dan Zimet. Sean Lenning and Marcos Chavez faced singles finalists Killian Carroll and Martin Mulkerrins in the bottom bracket semifinals, with the foursome playing one of the best matches of the tournament. Team Lenning/Chavez took game one, while Team Carroll/Mulkerrins took game two to force a tiebreaker. Team Lenning/Chavez built a 9-6 lead in the tiebreaker and closed out the match with a Chavez fly kill to score the tenth point and a 32-foot Lenning kill for the eleventh point. “There is nothing sweeter than winning a tiebreaker,” stated Chavez. Catriona Casey and Aisling O’Keeffe needed just 24 minutes to overcome Suz Entzeroth and Tracy Davis in the upper bracket semifinals, while Aisling Reilly and Martina McMahon were equally dominant in the upper bracket, ousting Ireland’s Ciara Mahon and Pauline Gallagher. Cork hotshot Killian Carroll is on top of the World tonight after being crowned Men’s Open Singles World Handball Campion at the University of Minnesota today’s when he overcame fellow Irish man Martin Mulkerrins in a trilling final. The Men’s Senior Singles Final was a match of spectacular kills and unbelievable serving by both players. Mulkerrins started at a frantic pace and led 8 nil before Carroll got off the mark. Mulkerrins extended his lead to 12-4 before Killian got into full flight and brought the score back to 10-12 Points were hard to get at this stage but Mulkerrins extended his lead to 15-12. Carroll got Mulkerrins out with a subline right corner kill before going on a run which included two ace to lead for the first time at 16-15. Killian extended his lead to 19-15 but Martin fought back to trail 16-19. At this point there was a tremendous rally with some astonishing retrieval shots by Carroll before he put Mulkerrins out. The Cork native made no mistake at this point and closed out the game to take the first 21-16. Once again Mulkerrins started the brightest in game 2 and went into an early 4 nil lead and then extended it to 8-4. Carroll rallied to trail 6-8 but once again Mulkerrins extended his lead to 12-8 before Carroll brought it level at 13 all. The game was finely poised at this stage and they were level again at 14 all & 16 all. Mulkerrins again pushed for home and led 18-16. However, four kills and an ace serve just when they were most needed saw the 24-year-old Cork man close it out on a 21-18 scoreline. Carroll is the first new world champion to be crowned since Paul Brady won his first title of five in 2003. Meanwhile, in the Ladies Open Singles, Cork’s Catriona Casey and Team Ireland’s Martina McMahon will renew rivalries once more, with both players reaching their expected final destination. Casey and McMahon have served up some thrilling battles in recent years and this World Championship final is likely to feature some heated exchanges tomorrow after today’s semi-final wins over Ciana Ni Churraoin and Aisling Reilly. In the Men’s Open Doubles final, Team Ireland’s Robbie McCarthy and Diarmuid Nash will take on Marcos Chavez and Sean Lenning (USA). After a brilliant all-Irish final, Mallow’s Killian Carroll is the new world handball champion after he delivered an outstanding display to see off Galway’s Martin Mulkerrins in the final of the Men’s Open Singles in Minneapolis this evening. The Moycullen man was awesome in the opening exchanges and tore into a 10-1 lead with some magnificent power play. However, Carroll eventually settled, earning his first three points with a fly kill, a pass down the left, a flat rollout and an ace serve, which in a way told the story of the game. Those were the shots Killian utilised brilliantly but while Martin made some uncharacteristic misses, he still played an outstanding game and contributed greatly to what was a very memorable final. Carroll caught his opponent at 15 in the first game and closed it out 21-16. In the second, Mulkerrins looked a little jaded at one point but came roaring back and looked set to close it out when he led 18-16. However, four kills and an ace serve just when they were most needed saw the 24-year-old Cork man – now based in Boston – close it out on a 21-18 scoreline. Carroll is the first new world champion to be crowned since Paul Brady in 2003. Cavan’s Brady qualified for the semi-finals here but was forced to withdraw due to a badly sprained ankle sustained during his quarter-final win over Mexican Luis Cordova. “It’s my first World Championship but what means more than the title is the field I came through,” said a delighted Carroll after the game.